BLAKESLEE Colonel Donald, Distinguished Service Cross with Cluster, Silver Star with Cluster, Legion of Merit, DFC with seven Clusters, Air Medal with seven Clusters, DFC (British), Croix deGuerre avec Palme (French). 1938 commissioned; 1940 RCAF; 1942 133 Eagle Squadron; 1942 Fourth Fighter Group based at Debden,Essex; promoted to Commanding Officer in January 1944. Under his brilliant leadership, the Group destroyed over 1000 enemy aircraft. 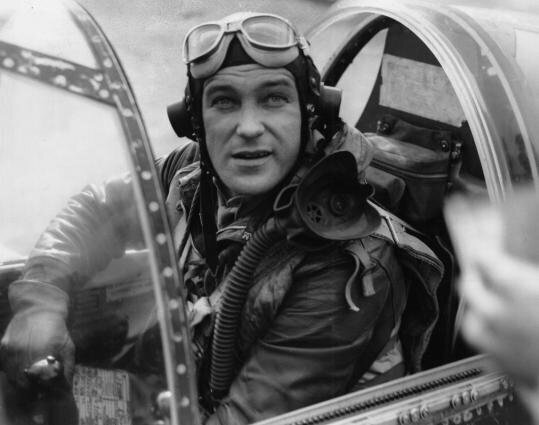 In 31/2 years Blakeslee personally flew more than 500 combat missions. When Goering saw Mustangs over Berlin, he said: "We have lost the war!"